Make a Skinner Blend Bullseye Cane. NOTE: If you do not know how to do this, go to this tutorial to see how to make a Skinner blend Bullseye Cane. Cut your Skinner Blend Bullseye Cane into four equal sections. Take each section and lay it down side by side. 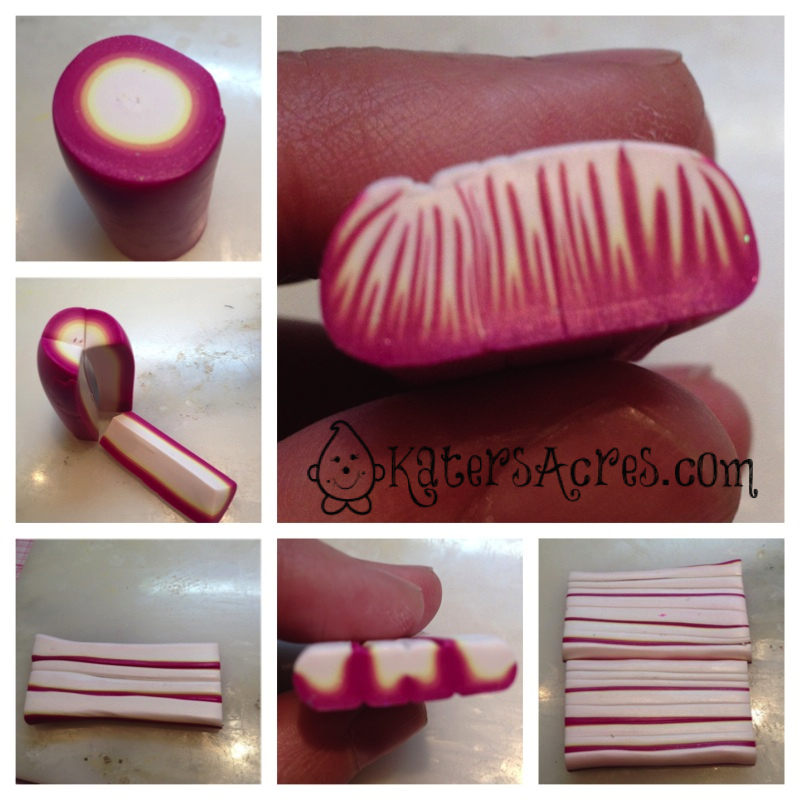 Reduce this section to twice its length, you will have 4 colored sections in your cane. Reduce again to twice its length, you will now have 8 colored sections in your cane. Reduce again to twice its length, you will now have 16 colored sections in your cane. You can stop here if you like the look of your cane. If not, reduce again to twice its length, you will now have 32 colored sections in your cane as show in the picture at top right. The idea for this cane came from Lisa Clarke of Polka Dot Creations “Weave Cane” tutorial, this is how she begins her Weave Canes. Be sure to check out the tutorial if you want to see her take on this same basic cane idea. Reduce your final portion of cane until you have at least 4″. Cut the cane in half. Turn one half over so the opposite side faces up. Pick a color for a center vein. Something that matches your skinner blend plug, I used orange. Choose ONE half of your cane. Place the center color in the center of the cane. Gently fold the cane around the center strip. 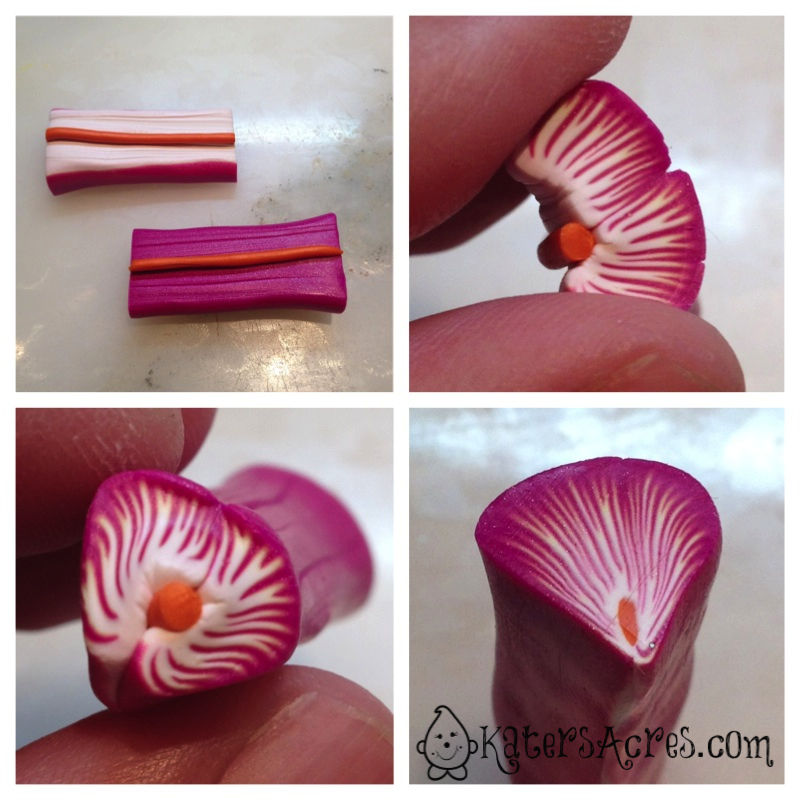 Use your fingers to shape the cane into a petal shape. Use the last section of the cane. Once again, place the center color in the center of the cane. For this second variation, fold the opposite color edge around the center vein. Now wasn’t that fun & easy?! 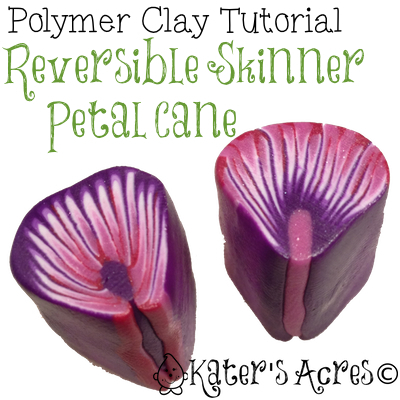 I hope you make lots & lots of these great petal canes. Thank you so much for all your wonderful instructional videos and your time doing them. I’m learning more each day and getting better at clay-skills. You’re very welcome Louise! I’m glad you’re learning. Continue to learn and absorb and your talent with clay will grow with every minute you put in. Thank you! Enjoy & bless you too, my friend! I am a newbie to the clay beads and I am already addicted! A year ago I bought clay to make Minions (yellow and purple) as decorations for my twins birthday cake. About a month ago I was on Pinterest and saw all of the jewelry you can make using clay and I thought- I have some of that left over! Now I’m hosting a party this Sunday afternoon for some girlfriends, and we are going to make beads! 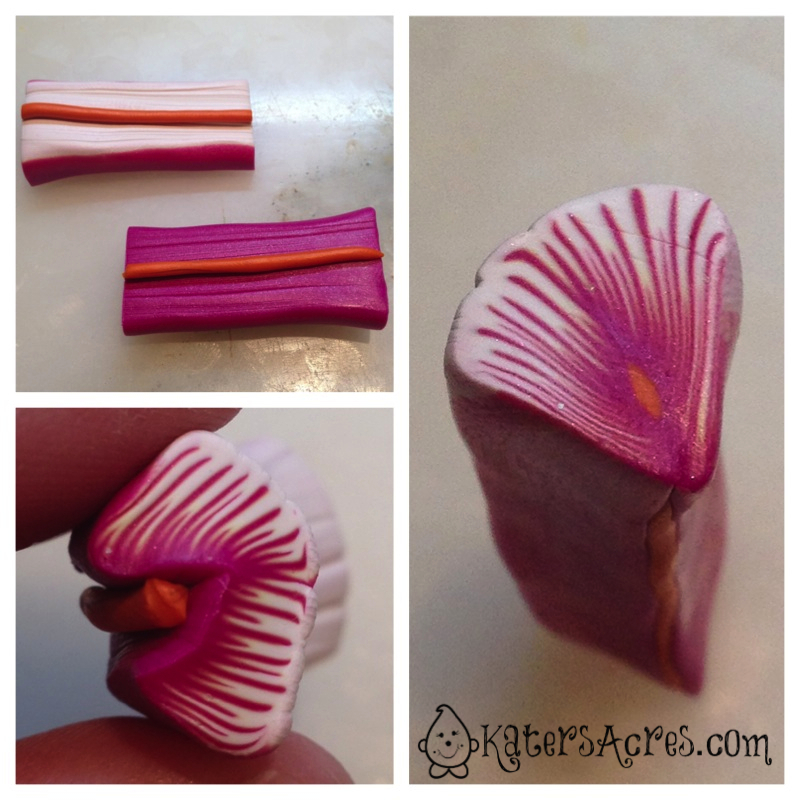 I love making jewelry… I started with acrylic flowers and alcohol inks. I have so many projects going at once, and now I have to try this! I guess my kumihimo beaded necklace will have to wait! Do you ever seal or dip your clay to make it shinny? I seal my pieces that will be worn or that have an additive like blending chalks, mica powders, etc on them. But I do NOT seal my figurines as a general rule. I’m glad you are having a good time with clay! Thanks for stopping by! Thank You Soo Much for your free tutorials, lost my job and am trying to hold on. free tutorials really help! I can’t afford to buy them, am trouble getting my supplies. I am very grateful to you for sharing and your kindness! Thank You!!!!!!!! Katie, thank you SO much for sharing this tutorial. I am spatially dyslexic, so I tried creating these kinds of flower canes, and ended up with something completely alien (). These instructions are very straightforward and easy to follow. 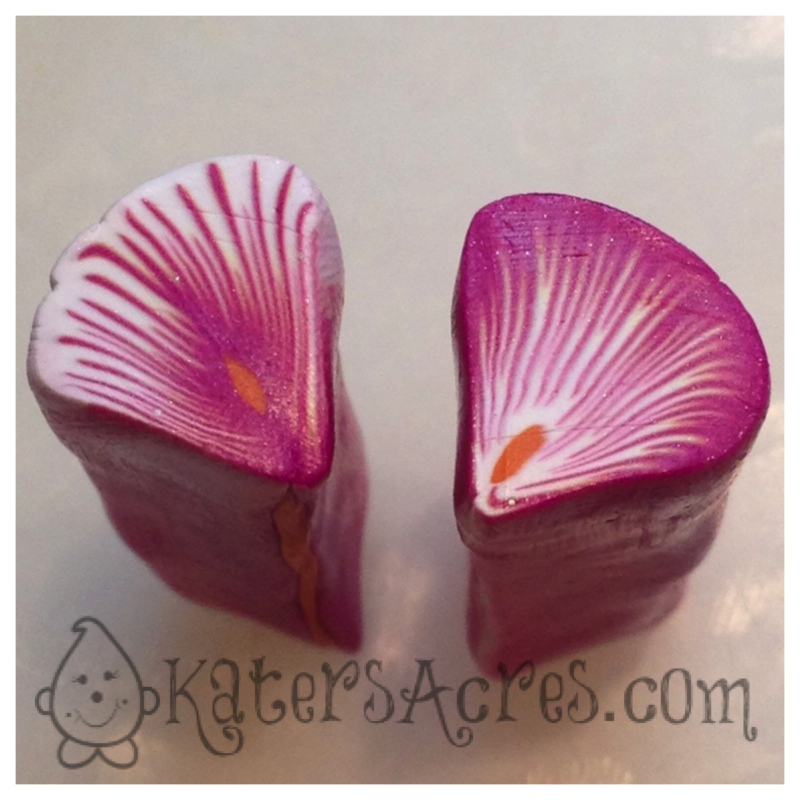 I can’t wait to use the Pink-to-white skinner blend plug I’ve been saving, to make your flower canes. P.S. I want to support your time and effort, so I look forward to shopping your sites for supplies and tutorials. Thank you Sandy for the compliments. I know your canes will be beautiful! Feel free to come back and leave a link to the picture. Thank you also for browsing our tutorials we have available for purchase. I’m blessed that you recognize the amount of time & effort put in. Thank you! Thank you for sharing this ! I’m below beginner when it comes to caning and I experimented with making a skinner blend and it came out nicely but I thought then what do I do with it ? Many people rolled it into a bulls eye cane which I did but again got stuck at what do I do with it now ? This is a very simple idea on what to do with those bulls eye canes I made. I’m gonna try it out and make some flowers. They’d go great with my other non-cane clay creations. I’m so glad you liked this one! Sometimes knowing what to do or “what’s next” is the hardest part of claying. I’m glad your willing to give it a try. Feel free to come back and post a link to your finished flower canes so other people can share in them as well. I am so happy that I found you! Thank you! I can’t wakt to try this today ! Great! Enjoy Jamie. Feel free to come back and share a link to your results! Thanks so much Katie! I can’t wait to try this neat trick. You are more than welcome! Thanks for asking & enjoy!